The mystery SAL is finished. I'm looking for a nice fabric to match the design and make a wall hanging for it. The winter SAL has its 5th part done, I'm waiting for the 6th part to be sent now. The 7th part is already sent, so I will have to stitch fast. I've seen in the picture album that I'm not the only one who's behind, probably the Christmas period is so busy! 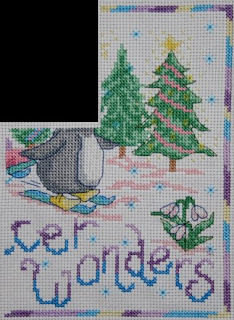 The Christmas card is for a penfriend in the Netherlands, it is the latest freebie of Michael Powell. 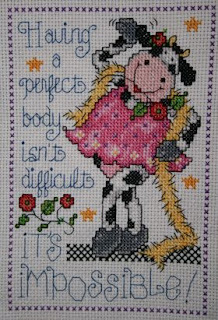 I will stitch it for myself once more as he really is one of my favourite designers. I ordered some of his little gems and I got free stationary with it, so wonderful! Yesterday was Christmas market in our village, we didn't go as hubby was too sick. On Friday we had to go to hospital for new pain medication. Fortunately the doctors are so willing to see us and help him. The good thing is that the pain will be controlled better, the bad thing is, he will be sleeping most of the day. I have put the bed from our guest room in our living room now, so he can be with me when I'm home, he always was upstairs and we hardly saw each other. Because of the pain, I can't sleep in the same bed with him, so we sleep separate already for some months. Now I sleep on the coach, the new medicines can make him dizzy, I want to be there in case he will fall. Fortunately I will have to work only one week more and then I have holidays until next year, so I don't have to worry about him being alone. Our cats love to be on the bed with him and he loves the company of them. 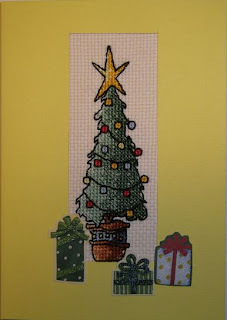 I Love that Joan Elliott finish, i hope to stitch it next year. The winter SAL is coming along great and that's a beautiful card for your friend. Sorry to hear of DH's pain, hope and pary the medications help.